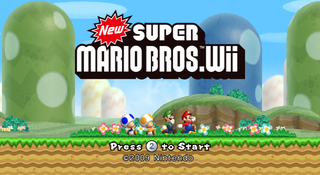 New Super Mario Bros. Wii takes the revamped 2D side-scrolling action from the DS title and kicks it up a notch by what many fans would consider a dream come true: simultaneous cooperative multiplayer in the main game. It also marks the return of Yoshi, the Koopalings, and Kamek, and pretty much set the standard for the Mario universe in the years that followed. Unused koopaling object that uses an early model and was seen in prerelease footage, may have other differences. unused water_lift sprite that can be fixed with Newer asm hack. More unused actors (objects that you can't put in a level normally). New hits and old favorites. Things that just don't come into play. The US and European translators can't seem to agree with each other. 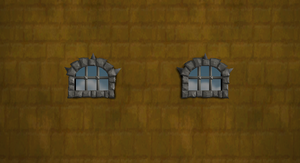 Sometimes there's stuff drawn or written on tileset images that is invisible due to the alpha channel. They can be found on many invisible tiles used only for collision, and indicate the type of each. They may have been used in Nintendo's level editor. 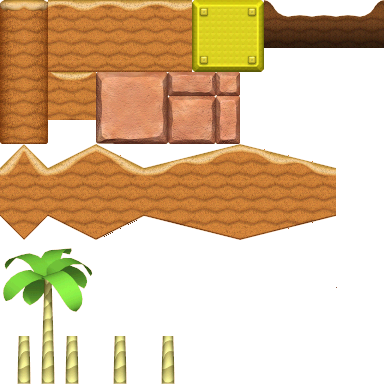 The desert tileset (Pa1_sabaku.arc) has a simple collision-less palm tree object (like in New Super Mario Bros.) that goes unused in the game. It was replaced by animated 3D sprite palms that you can stand on. This tileset also has graphics for upside-down slopes, but none of the tiles are even assigned to objects in the tileset. Pa1_toride.arc 's first tile is a pink block. It's assigned to a lot of objects, but none of them are used. The block itself bears a resemblance to ones that appeared in E3 2009 screenshots, but most likely was 'dummied out' via recoloring. As seen in prerelease screenshots, snow levels were meant to use a gray variation of the basic block tileset. They went unused in the final game, but the file is still present (Pa0_jyotyu_setsugen). The credits sequence stage gets its own standard tileset. The only tiles used there are the invisible solid ones, so the rest go unused. It appears to be a version of the main standard tileset rendered with an early alpha mask that no longer matches the texture. Most notably, the silhouettes of two arrow signboards and a climbable pole can be seen, indicating that these were once part of standard tilesets. (They are both 3D models in the final game.) There is also some sort of vine or stony ladder. The donut block is also depicted in-tileset, instead of having a blank space - in the final game, a 3D model is drawn over the tile, making any in-tileset graphic pointless. obj_block.arc contains an early design for the block roulette, similar to the one in New Super Mario Bros.. It also includes early icons for the powerups. Note the change of Mini Mushroom to a 1UP in the final, and lack of Ice Flower in the early design. 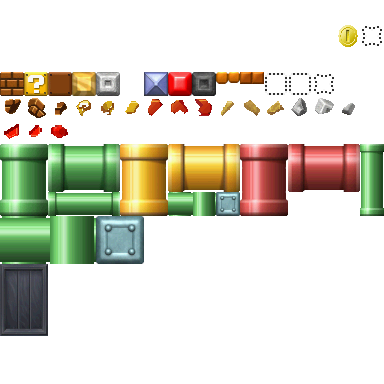 obj_block.arc also contains a placeholder winged block, which uses the block texture from New Super Mario Bros.. 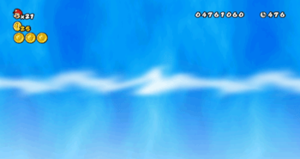 The final game uses block_pata.arc. There's an early coin file (coin.arc), which contains a flat model and a texture of the coin from New Super Mario Bros.. While this texture from New Super Mario Bros. is used to mark the course spots on the world map models, it's invisible in game. 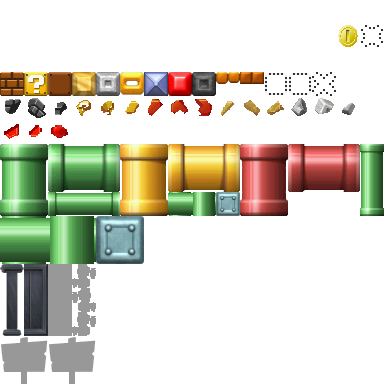 obj_dokan.arc contains broken pipe models that would be used by the unused Mega-Mario flying pipe actors. As you can see, they're a bit lacking in texture, though. Seen in E3 2009 footage, this fantastical 2D background was replaced by more realistic ones. Called boss_hikousen_bg (boss_airship_background). It doesn't look anything like an airship, though. It uses a different filename format (the others just use numbers) and internal file layout to the other backgrounds. 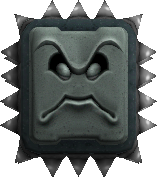 The file that contains textures for the stage icons in the Coin Battle and Free-for-all multiplayer modes has an icon of Larry being battled by Mario, named im_W1_toride_00.tpl. It's never displayed by the game, as it uses im_W1_toride.tpl for the W1 tower icon. What's interesting is that it shows how the early Larry boss platform looked. It's also unique because Mario is in the image, which doesn't happen in any other Coin Battle icon. Found in the pink extending mushroom archive (lift_kinko_yoko.arc) is a early texture for the end of the stem called lift_kinoko_yoko_kasa, the final is called M_kinoko_yoko_kasa. The items menu layout archive (stockItem.arc) contains 2D item graphics and appropriate layout data, but they aren't used in-game - separate 3D models are used instead. 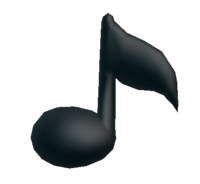 A music note, which appeared in prerelease screenshots, is still present in the game files (note.arc). The checkered spring block file (block_jump.arc) still contains the old texture shown in E3 2009 screenshots. The file env_wind contain some cloudy textures similar to those used for the usual cloud/mist effects. These textures, however, have writing all over them. According to the text, the first three are meant for regular stages, while the last three are meant for desert stages. Since the textures are almost entirely white with transparency, the above image shows the files on a black background. The original files can be found below. The final game only uses one type of wind effect, and its textures are stored as wmy_bgsnow.3 (and 4 and 5) inside env_snow.arc. It's also handled by the same sprite as the falling snowflakes effect, and uses most of the same code. It is only used in World 2-4, a desert level. The Prickly Goomba enemy from World 9-7 has an early model under the name iga_kuribo.arc. It lacks the frames for the Goomba's eyes and has different animations. This file is mentioned in the boot.dol. 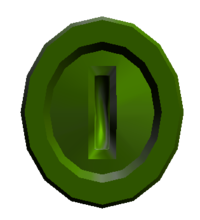 The coin object file (obj_coin.arc) contains a model and texture for a green coin, but it never shows up in-game. It was originally going to be used as the "collect 8" object in the enemy world map ambush courses, but it was later replaced by Toad Balloons. The Toad Balloon object is still named EN_GREENCOIN by the game. Green Coins are used in the sequel New Super Mario Bros. U, with the same appearance but a different functionality. There are two files for a normal, non-icy snake block; block_snake.arc and snake_block.arc. They both contain a texture similar to the one used in New Super Mario Bros.. For some reason, snake_block.arc 's texture is of a higher resolution. snake_block.arc is unused. 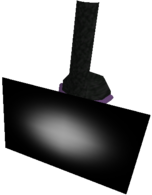 The purple climbable pole found in 3-Ghost House is rendered as a 3D model. An unused 2D version also exists, which has somewhat different coloring and shading. It's actually fully functional if placed in a level. 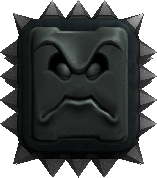 The Thwomp/Big Thwomp model archive contains an early Big Thwomp model called big_dossun. The used one is called dossun_big. The sledgehammer (lift_zen_hammer.mdl0) that appears in World 8-6 has a duplicate inside the Tower Boss Door archive (obj_door_torideboss.arc). Many models contain duplicate (or near duplicate) textures. 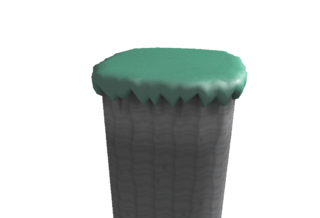 The Big Wiggler "body" model file contains a red variation of the main texture, but Big Wigglers never turn red. There is an unused actor for these palms. The model CS_W3_Palm is an arrangement of palm trees meant for the island-themed world. This indicates that the island-themed world was originally going to be World 3, just like in New Super Mario Bros., instead of being World 4. To further support this, the name of the tree texture in both models is W3_YashiA. The texture used by the World 3 version is twice as wide as the final version, adding more ridges to the tree leaves. 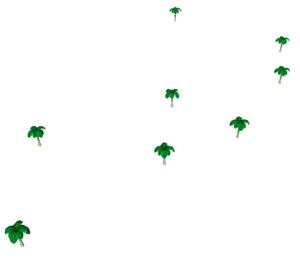 The tree arrangement barely matches with the terrain of World 4 at all, with two of the trees being higher up than the ground and none of them being at beach height. It also only has 8 trees, all the same size, rather than the 18 trees of two sizes used in the final version. Other World Map texture names also suggest that World 3 was once the island-themed world. In cobGrid.arc in the WorldMap folder is a simple grid, most likely used by the mappers to create world maps. There are a total of 82 hint movies. While 62 of them are used, the rest of them go unused. They mostly contain Super Skills, and are broken due to the level layout being different from when the inputs were recorded. The Big/Medium Goomba model has one unused animation in which it becomes flattened. It is different from the small Goombas' flattening animation. These both were likely used with early versions of the model, because they do not fit the current bone structure of the model and look wrong when these animations are used through hacking. Spike Tops and Chain Chomps can be bounced off with Yoshi. The former is also unused in New Super Mario Bros. U. Both are used in Super Mario Maker. Chain Chomps, Thwomps and Prickly Goombas have hitboxes that are impenetrable by Yoshi's tongue. Switches can be pressed by Yoshi, even when the player is not riding Yoshi. Dry Bones have the standard behaviour for overworld enemies being in water (splashing when entering and moving slowly when in). 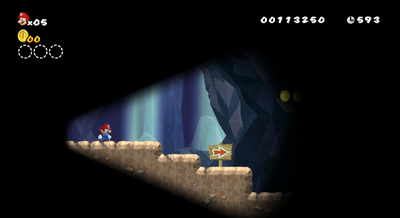 There is an unused "dark" lighting setting which causes triangular light beams to be generated by each player. The beams face the same way as the players. There are a few unused messages left in the game. First message in the file with obvious purpose. minutes, the session will automatically end. From the E3 2009 demo. It was shown on the title screen. Also from the E3 2009 demo, obviously displayed when the session ended. Many, if not all, the sound waves that were in NSMB are also present here with their original filenames. These will not be listed. The NSMB coin sound. This can be heard in prerelease footage. There is no Nintendo logo screen in this game. In prerelease screenshots, we see that the game originally had a Red and a Blue Yoshi. They were changed to Pink and Light Blue in the final version. The filenames for the Yoshi models, though, still follow the old colouring: Y_tex_red.arc, Y_tex_blue.arc. The game was originally going to have Mega Mario, but it seems to have been canned very early on - EN_ITEM (the actor which manages the various powerup items) has an empty value which loads a mushroom model from I_big_kinoko.arc, but it crashes the game when used, and it does not have any other code which uses the value. There is no way to enable it without ASM hacking. The file I_big_kinoko.arc does not exist, and it is not referenced by the game otherwise. Also, as other evidence of Mega Mario having been planned, the "flying pipe" objects were ported over from New Super Mario Bros. but are not used in the final game. The pipe joint texture used in the World 6 Map and the World 6 Map icon depicts an earlier pipe joint. It can also be seen in the E3 2009 demo version. The cliff texture used in the World 7 Map depicts an earlier athletic tileset. It can also be seen in the E3 2009 demo version. The exception handler is still in the game's code, but can't be seen normally without hacking or causing an exceptionally heinous glitch. When it does crash, press HOME, -, +, -, +, 1, 2, 1, 2, A on Player 1's WiiMote. The player will then see the processor state at the time of the crash, as well as some trace info. Find the other versions and get the filenames from them. Previously on the page: "V2 US: Built on January 5th, 2010. Revision 37821. Disc is marked as "version 2"." An empty file exists in the main folder with its filename, shows what revision the copy of the game is and when it was compiled. This page was last modified on 18 January 2019, at 03:47.